Summer 2015 has brought the usual annual release of the ProMonitor and ProPortal software which provide a number of noticeable enhancements and slight changes to functionality. 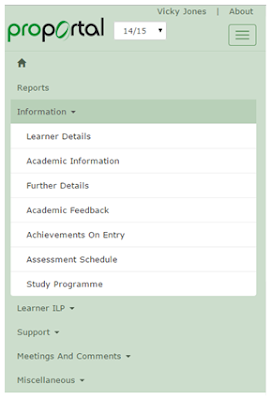 This year there are only minor changes to functionality within ProMonitor which provides the staff view of all student ILP and markbook pages. 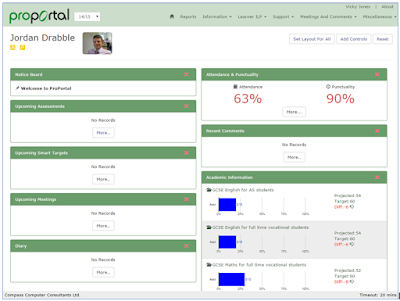 The most significant changes are to the student view of their individual ILP and markbook from within ProPortal. ProMonitor now has a clear indication if SMART Targets are attached or not within the markbook, by providing a tick on the SMART Target dartboard icon on each of the tabs. You can have Unit 1 and Unit 2 on the left and Unit 3 on the right. This will mean either Unit 1 or Unit 2 combined must be over the minimum score or Unit 3 must be over the minimum score. This is then reflected in the core unit summary overview in the markbook by student and the academic information page. Please contact LT@chesterfield.ac.uk if your team delivers this type of qualification at College and would like assistance in setting it up on markbook. 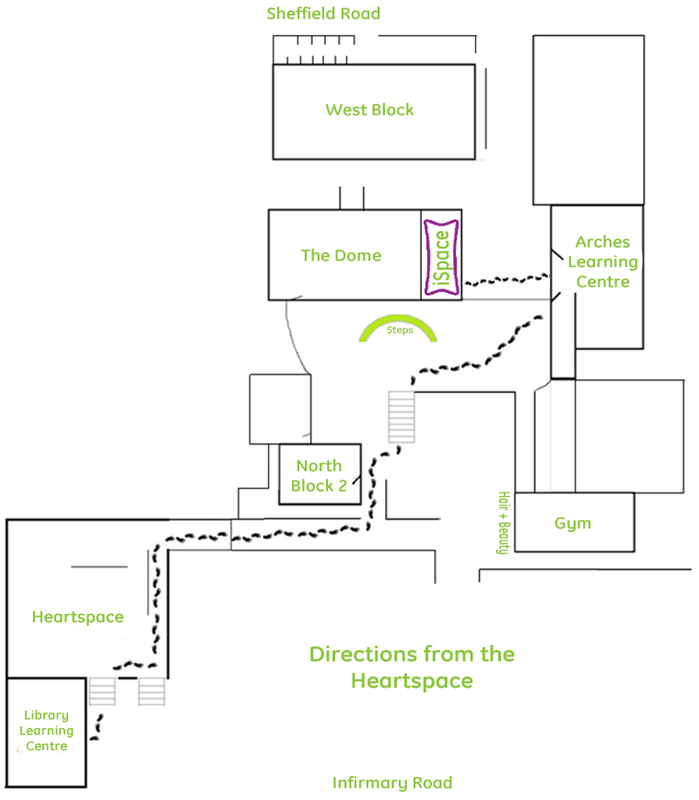 A ‘Send Notification Email’ button has been added to Meetings Circulation List. This will send notification emails of the meeting to all Staff and Students within the circulation list with an email address. Note that sending emails will not update the ‘Informed’ flag against a member of the circulation list. 'When all L tasks completed, grade the assessment PL1 (Pass at Level 1)' to cater for NQF Level2 course which can be passed at level 1. This is an addition to the existing markbook rule to award a PL1 grade at unit level. A fresh new look for the Menu (Navigation Panel), this is a responsive view which will shrink according to the size of the screen. The Upcoming Assessments will look at the Assessment Schedule and list the first five assessments due prior to date. The Upcoming SMART Targets will look at the SMART Targets created against the student and list the first five due prior to date. The Recent Comments will look at the Comments created against the student and list the first five due prior to date. The Upcoming Meetings will look at the Meetings created against the student and list the first five due prior to date. The Diary will look at all events (Meetings, Comments, SMART Targets, Upcoming Assessments & Personal Diary Items) created against the student and list the first five due prior to date. 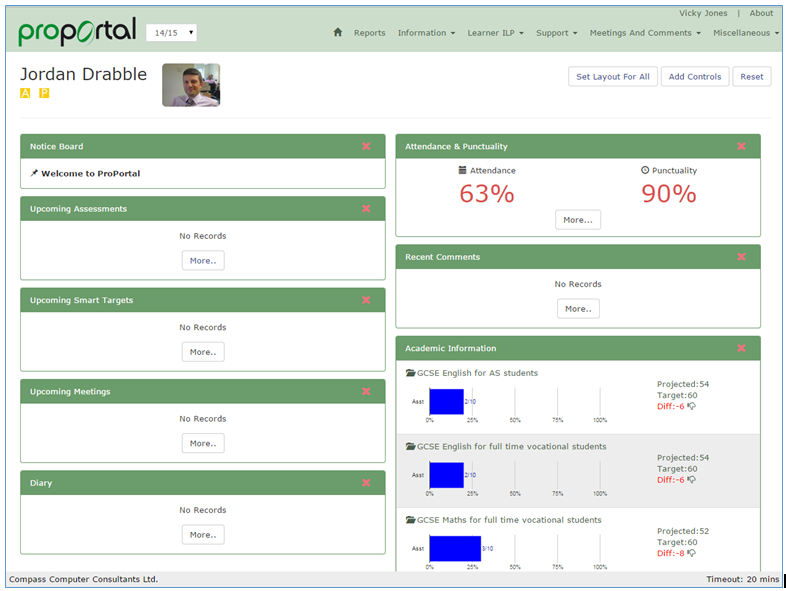 The Attendance & Punctuality will look at the latest Attendance & Punctuality in the system and display the % marks. The Academic Information will be re-labeled as Markbook Information & Progress, and is the same graph used in the Markbook Information & Progress Summary page informing the student of their % of completion from the Markbook.